Description: 8107 & 8242 lead a train out of Walbridge, OH. Description: CSX F789 crosses Greene Street and gets the blocks to Newberry where it will take the siding for a southbound. Description: Close up of F789 as it throttles up through "The Ditch". Description: CSX 8888 "Crazy 8's" leads 8107 and auto racks towards the yard limits for a quick crew change. Description: CSX 8888 leads 8107 and auto racks into Manchester yard for a quick crew change. Description: CSX 8888 "Crazy 8's" leads 8107 and auto racks to a stop at the yard for a quick crew change. Description: An interesting lash up, including a stealth CSX SD40-2, a Canadian National GP40-2LW, and an Illinois Central SD40-2, lead a train east at Milepost 215. Description: A pair of helpers are pushing on an eastbound grain train. Description: Conductor of yard job Y550 departs the cab of SD40-2 8107 at Locust. Description: Pair of SD40-2's trundle out on 2 at Locust with 10 hoppers on CSX work train Y550. 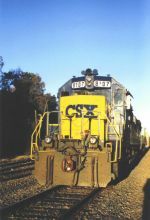 Description: 2 SD40-2's reverse into RG.